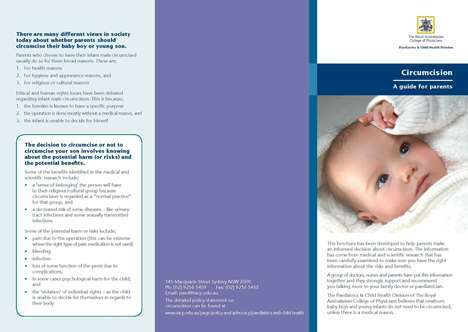 The Paediatrics and Child Health Division of The Royal Australasian College of Physicians (RACP) has developed a parent information leaflet (revised February 2012) to help parents make an informed decision about circumcision. The information has come from medical and scientific research that has been carefully examined to make sure you have the right information about the risks and benefits. A group of doctors, nurses and parents have put this information together and they strongly support and recommend you talking more to your family doctor or paediatrician. The Paediatrics and Child Health Division of The Royal Australasian College of Physicians believes that newborn baby boys and young infants do not need to be circumcised, unless there is a medical reason. A position statement to provide expert opinion and information to help clinicians and parents to make informed decisions. Its conclusion states: After reviewing the currently available evidence, the RACP believes that the frequency of diseases modifiable by circumcision, the level of protection offered by circumcision and the complication rates of circumcision do not warrant routine infant circumcision in Australia and New Zealand. However it is reasonable for parents to weigh the benefits and risks of circumcision and to make the decision whether or not to circumcise their sons. This page last reviewed 25 May 2018.